The Renewable Fuel Standard and the RIN system battles to hold ground after coming under fire time and time again by big oil interests. That’s how Minnesota farmer Chad Willis sums up the Renewable Fuel Standard (RFS), but also why he says the policy – including the Renewable Identification Number (RIN) system – continues to come under fire by big oil interests. The Willmar-area farmer chairs the ethanol committee of the National Corn Growers Association and serves on the Minnesota Corn Research & Promotion Council’s board. Willis’ assessment appears sound. According to the U.S. Department of Energy, 2012 saw the lowest level of imported oil in two decades. Increased use of biofuels is a contributing factor. Despite progress, the country’s dependence on foreign oil remains challenging. In 2012, the U.S. had a net import of 7.4 million barrels daily and led the world in overall consumption. The RFS originated with the Energy Policy Act of 2005, later expanded by the Energy Independence and Security Act of 2007 (EISA). EISA calls for mandated increases of biofuel blending each year until 2022, when levels should reach 35 billion gallons of ethanol and 1 billion gallons of biodiesel. The U.S. Environmental Protection Agency created the RIN system to ensure compliance. RINs are used by obligated parties to show compliance with RFS mandates. Obligated parties are producers or importers of gasoline and diesel in the 48 contiguous states plus Hawaii, including blenders producing gasoline from nonrenewable stocks. Renewable Identification Numbers (RINs) are issued per gallon of biofuels at the point of production or import. Biofuel producers must follow EPA guidelines in creating the 38-character number that becomes the RIN. Once created, the RIN is reported to EPA. 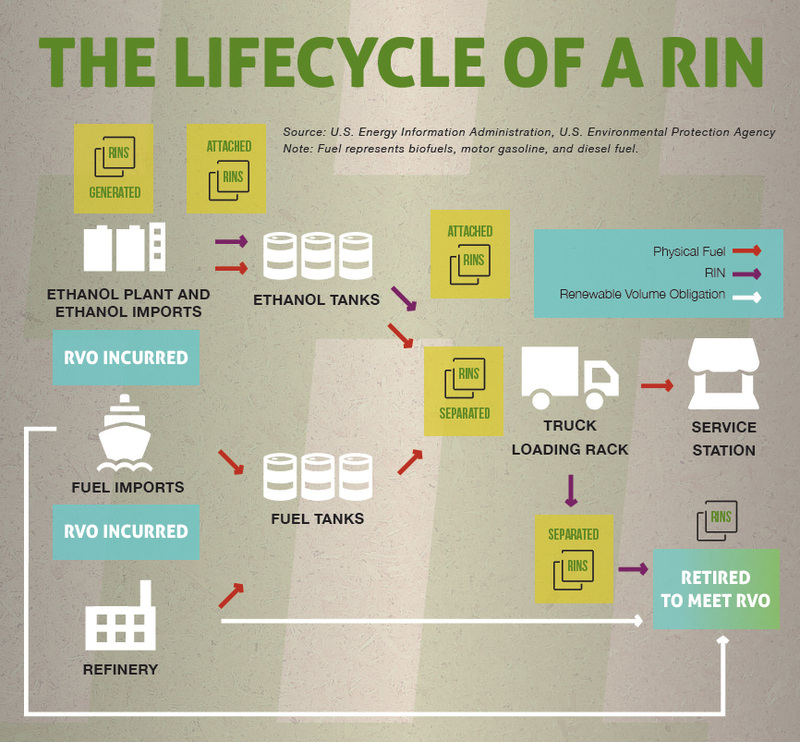 The RINs are transferred whenever biofuels change ownership. Those receiving the RINs must include a quantity of biofuels equal to a given percentage of their total sales of gasoline. Once blended, the RINs are turned over to the EPA to count toward that company’s mandated portion. At times, ethanol or biodiesel blending is greater than the mandated level, generating excess RINs for purchase as credits against shortfalls. This enables blenders to meet mandatory requirements without blending any biofuels. Blending may even temporarily drop below mandates. RINs can increase from a few cents to over a dollar. “Too many obligated parties are buying RINs instead of blending more ethanol,” Searl said. “In the backdrop, they have a massive undertaking to repeal the RFS. At some point, prices will get to where the obligated party will need to blend more biofuels to allow more RINs into the system.” Some attacks by big oil interests blame RIN prices for higher gas prices. “On average, only a portion of the RIN prices are passed on to the consumer since the RIN price is a cost to some fuel suppliers, but a source of revenue to others,” noted Darrel Good, Professor Emeritus, Department of Agricultural and Consumer Economics, University of Illinois at Urbana. Because of lagging gasoline sales this year, the E10 blend wall came into play. The fuel industry was unable to blend enough ethanol to hit the mandated biofuels level without going above the 10 percentlimit per gallon of gasoline. Those in the renewable fuel industry are all too familiar with opposition to the RFS and themisplaced blame on RINs. “Oil companies are flat-out unwilling to blend ethanol past 10 percent. Instead, they are paying a premium to not do their job. As a result, RIN prices have gone up,” said Tom Buis, CEO of Growth Energy, an ethanol industry advocacy group. But opposition can’t dispute what many see as obvious. “Petroleum companies are obviously looking for any excuse to explain why Americans are paying exorbitantly high gas prices, even as we’re drilling record amounts of domestic oil. Consumers are going to continue to be stuck with the bill until we have competition and diversity. That’s what the RFS is creating – and it’s working,” said Anne Steckel, Vice President of Federal Affairs, National Biodiesel Board, in echoing Willis’ sentiment.